Home / Posts tagged "Microwave radio"
High power radios are now available in 15 GHz and 18 GHz in the SAF Integra G Point to Point microwave radio product line. Maximum Tx power of these full outdoor radios is 23 dBm (in both frequencies). increase link availability (uptime) and fade margins. If you are hiring space on a third party tower, reducing antenna sizes can mean significantly lower site rental fees. Or you may have to keep antenna sizes as small as possible for a site with very limited space. Smaller antenna sizes also translate into lower equipment and freight costs and easier installation. For customers requiring fast data speeds it may be crucial to use 18 GHz for longer links as there is a large 55 MHz channel size available in this frequency band. High Tx power can be very helpful here. Customers can also save on annual ACMA annual licence fees by using 15 GHz or 18 GHz instead of a lower frequency. Savings are particularly significant in high and medium density areas. These are- Melbourne / Geelong, Sydney / Wollongong and Brisbane / Gold Coast (high density), and Adelaide, Perth and Newcastle (medium density). Last, but not least- achieving higher link availability and fade margins without increasing antenna sizes can be a big bonus, particularly for links in high rain rate areas and with mission critical networks. Australian users can achieve up to 226 Mbps full-duplex per radio with 15GHz 28MHz, and up to 472 Mbps full-duplex with 18 GHz 55 MHz. In New Zealand, the same speeds as the above apply for Integra G radios. In addition to this, New Zealand based customers can also take advantage of the 110 MHz channel size with Integra W radios for maximum speed of 883 Mbps full-duplex per radio. Integra W radios also have a high maximum transmit power of 22 dBm. All Integra G high frequency microwave radios (15 GHz and above) have two model options- Integra G and Integra GS. Integra G radios have integrated 300mm or 600mm antennas while Integra GS units are used with non-integrated (but slip-fit) antennas. Available sizes are 300mm, 600mm, 900mm and 1200mm. 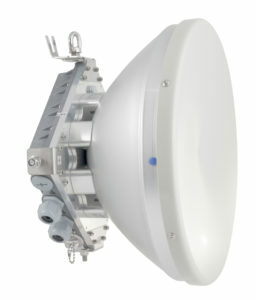 Our Australian stock includes some standard power 15 GHz and 18 GHz Integra G FODUs at this stage. Once the current stock is sold, however, we will be replacing it with the high power units. It will still be possible to order standard power 18 GHz radios, but we expect most (or all) customers will prefer the high power version due to the above benefits. We will only be manufacturing 15 GHz with high power in the future. Please contact us for further information. We will be happy to assist with selection of the most appropriate equipment to best suit your needs. 13 GHz licensed frequency band is now available in the SAF Integra G all outdoor (also called full outdoor or FODU) point-to-point microwave radio product line. no minimum link distance requirement from ACMA. This is particularly important for microwave links in high rain rate areas where it is crucial to select the lowest frequency available, yet 15 GHz and 11 GHz bands can only used for links over 5km in distance. Australian users can achieve 226Mbps full-duplex speeds in the 13 GHz frequency band. This is based on 28 MHz channel size available for licensing from ACMA. In New Zealand, customers can obtain a larger – 56 MHz – channel size. Maximum data speed is therefore higher- 472Mbps full-duplex per radio. SAF Integra G microwave radios also support packet header compression for additional speed (the speeds stated above are before packet header compression). 13 GHz SAF Integra G radios come with the trademark Integra extra corrosion resistant enclosures. This ensures longevity of the equipment and is particularly beneficial for links near the ocean. PoE ports make for easy single cable installations, and two SFP ports are also available for customers using fibre. The first 13 GHz Integra G radios are arriving in Australia this week. We will be delivering some of them for a government project in Queensland while the rest will be held in our Albury warehouse as part of our continuous efforts to extend and optimise our local stock in order to be able to deliver more customer orders faster. Please contact us for further information. We will be happy to answer any questions you may have or assist with path calculations and quotes for any links you may be planning. SAF Integra full outdoor radios are now also available in 7GHz (7.5GHz). This frequency band is ideal for medium to long distance links where the preference is to use a small 7MHz or 14MHz channel size (to reduce ACMA spectrum costs or for other reasons). Maximum data speeds are 41Mbps and 97Mbps full-duplex with 7MHz and 14MHz respectively (plus extra from packet header compression). Minimum path length is 20km. Contact us for further information, path calculations and quotes, we will be happy to assist. We are pleased to announce that all SAF Integra radios will be supplied with standard 5 year warranty as of 1st November 2016. Please note warranty covers manufacturing faults only. Standard warranty for other product lines as well as accessories will remain at 1 year. Contact us for full terms and conditions.